Cocktail Audio X10 (500GB) review | What Hi-Fi? It’s hard to argue with a long feature list, and that’s what the Cocktail Audio X10 has; it’s a mini-jack-of-all-trades. 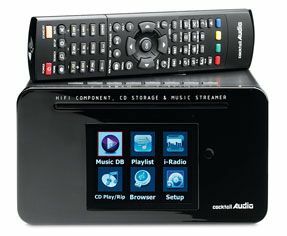 You can play CDs or rip them to its 500GB hard drive (a 1TB version is available for £20 more), stream and copy files from networked devices and listen to internet radio, too. Two USB inputs allow you to play and copy music to and from other devices, while there are 3.5mm input and outputs, an optical digital out and headphone connection. You can also add an optional wireless dongle or connect via Ethernet. The X10 is a compact, lightweight chunk of kit and looks smart enough. A bright colour (non-touchscreen) display offers quick access to the device’s key areas. It’s simple, clear and easy to read, but the remote is less so, cramming in a wealth of buttons and text. It does the job, though. Once hooked up, we could instantly see folders, files, track names and file formats on our XiVA musicm8 NAS drive, and a couple of button presses later they were on the X10. Apple Lossless, AAC, FLAC, MP3 and WAV files are supported for playback, as well as 24-bit high-resolution audio. You can rip tracks in a choice of formats and bitrates, too, with FLAC, MP3, OGG and WAV all on the menu, although it's worth noting that the X10 won't rip in Apple Lossless, but it will play any files in that format. The hard disk does make a fair amount of noise when ripping – we had our fingers in our ears for around four minutes for a whole album ripped as WAV files – and you can feel it vibrating throughout, which can’t be too good for sound quality. Add a pair of £180 Dali Zensors (we didn’t think much of the budget, optional speakers) and a WAV file of Friendly Fires’ Hurting sounded clear, fast and reasonably detailed. Bass notes were a little soft and treble notes sometimes took on a harsh edge, however – the best micro/dock systems about will sound better. But then a regular micro or dock system won’t do anywhere as much as the X10. Incredibly versatile and convenient, and a doddle to use, it’s just a shame it’s not a little more able sonically.